What’s Goes On in Public Works? It’s Emily Lofgren here with the City of Muscatine. I’m glad you’re taking the time to read more about the Public Works Department. As I’ve toured the various departments within the City, I have enjoyed learning how each department plays a significant role in making things run smoothly in the community. 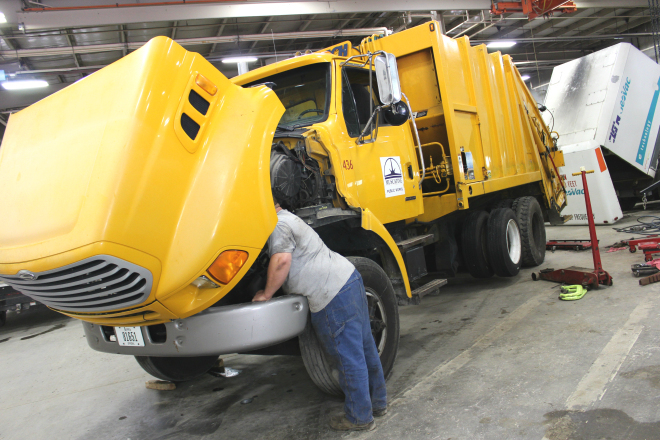 The Public Works Department is the largest department with 70 employees split into 10 divisions and a $12 Million operational budget. It was one of the first departments I began to learn more about. Sam Ravenscraft is a Vehicle Mechanic in the Vehicle Maintenance Division of Public Works. He spends his time making sure the vehicles in the department run smoothly. This entry was posted in Cities, City of Muscatine, Municipal, Muscatine and tagged City of Muscatine, Public Works. Bookmark the permalink.